On Dec 30th the first bikers set a new record for completing the Ben 10 Eco Challenge in a day. Stefan and Behan Boshoff were the manne in question. Just a few days later 2 KZN bikers also managed it - Jon Woodgate and Kevin Wallis. Local biker Chris Isted contests that if you didn't ride the whole of each pass, you did not complete the route. He has just submitted an entry with that in mind, showing his GPS track log. In essence Chris says you can't only do the ascent, take your photo and consider that pass ticked off the list (2 good examples are Naude's Nek and Lundin's Nek passes). You must ride every pass completely according to the GPS coordinates in the website. Stefan produced a great video which you can watch via this link, which will take you to our latest news page and from there a second link will take you to the Ben 10 page and Stefan's video. At MPSA we would like to congratulate all the riders who have been able to achieve this. It requires good planning, stamina and reliable equipment. OK - who is next? Re: Ben 10 in 1 day! I'm inclined to agree with Chris's opinion that you have to ride the full pass to claim it. What would the best time of the year be to plan to do this challenge? I am currently looking at late August this year. My opnion, late October/Early Nov or else mid to late April. More daylight and less likely to get rain especially late Oct or early Nov. I'm off course talking about doing it in a day. Multiday winter would be fine. 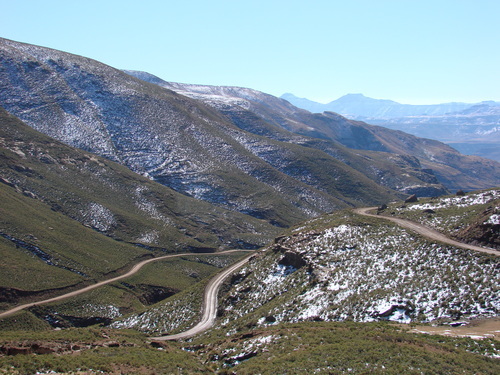 August you'll have trouble with Ice getting up Benmac and maybe some places along the Cairntoul road or Naude's Nek. Thanks Kortbroek, we plan a multiday trip, 5 days from Gauteng and back. Will plan for October/November, did most of the passes already, except the Baster, Otto du Plessis and BenMac passes. When we were there to do BenMacdhui the ski slope was over the access route, so just check for that. On riding the whole pass to claim it, I think the website only states that a pic of the sign must be taken to complete the challenge, no detail on riding the complete pass? Right? When we wrote the rules for the Ben 10 we (incorrectly) assumed that everyone would want to complete each pass in its entirety. That is in the true spirit of the challenge. However, some people are short on time, and only ride half the pass, take the pic and that's it. One way or the other that's OK with us. We aren't here to nitpick, but the way we envisaged it, was to ride all 10 passes in full. One of the problems with writing rules for competitions is that you can't change them halfway through, as it then disqualifies a fair number of people who interpreted the rules in a different way. So if you are a true sportsman - ride the whole thing and claim your prize with dignity and ethos.